- designed the crossover in such a way that it copes easily with the high power. The crossover frequency is 2.1 kHz with 18 dB / octave to avoid an overdriven tweeter, while the phase response remains in tact. The 60 litre bass reflex speaker has a high efficiency of 99 dB, a power handling of 450/900 Watts (continuous/peak) and a frequency response of 50 - 18.000 Hz (with a fluctuation of only +/- 1.5 dB between 70 - 17.000 Hz). 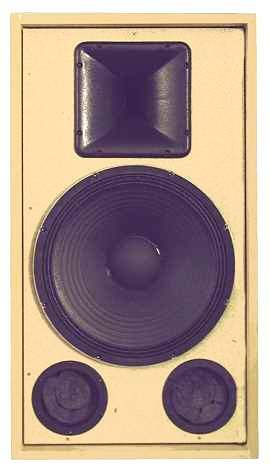 The frequency response is measured at the tweeter's lower edge, in 2, 4 or 8 metres distance. Please enquire for additional data should the listening position be considerably lower or higher. air core coils, foil capacitors and resistors. The napped foam should be fitted to the upper half of the rear wall, behind the DE25 and the bass driver. 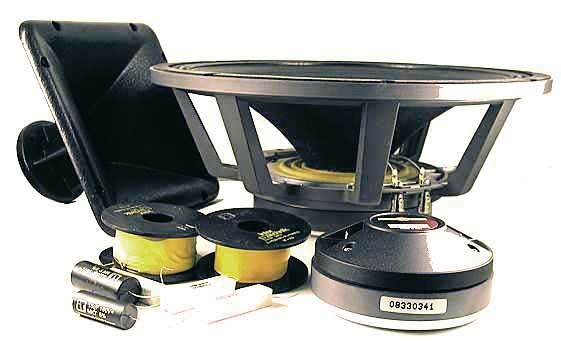 If you prefer a lower cabinet the two bass reflex tubes may be replaced by a 22 x 6 cm duct with a depth of 10 cm. Therefore, the horn needs to be moved 6 cm to the side. Two wooden panels are needed, one with 22 x 8 cm, one with 9.8 x 8cm. This reduces the height by 14 cm, while the depth is increased by 3.4 cm, ensuring the same volume. The crossover kit with wiring diagram is included.